Prime Minister Narendra Modi, has spoke about demonetisation and said that the move was for “national interest” and not for “political gains”. He said “India could not have notched up its fast pace of GDP growth without employment generation” and that “60 million jobs have been created in micro, small and medium enterprises (MSMEs) alone in the last four years”, in an interview to Hindustan. Speaking about the demonetisation drive, PM Narendra Modi said that he is quite happy with its outcome. “It (black money) was a blight that no one dared to touch it. I’m sure you know that when there was lesser number of currency notes with highest denomination of ?100 in India, Indira Gandhi had come up with a proposal (to demonetise). According to a book, Yashwantrao Chavan told her- Do you want to do politics or not? Do you want to fight elections or not? Don’t fall in this trap. So, demonetisation might not have suit political arithmetic but for the national interest it had to be done. We did it for national interest, not for political gains”, the report added PM as saying. 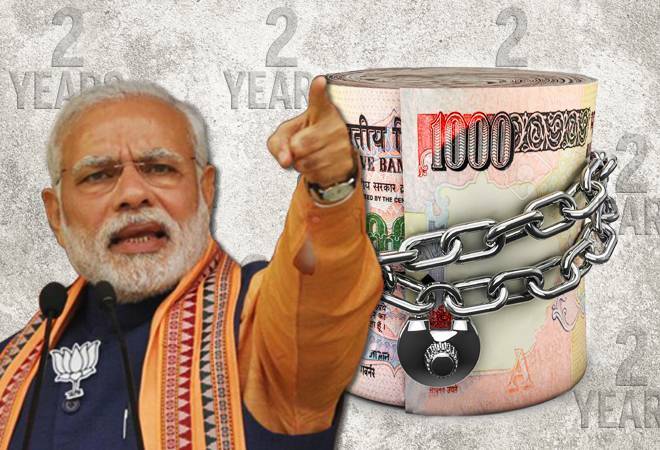 He also said that their government’s steps against black money in the past four-and-a-half years have resulted in the recovery of Rs 130,000 crore which has been taxed and awarded penalties. “Properties worth Rs 50,000 crore have been seized”, he added. PM Narendra Modi said that during the period of demonetisation, Rs 6,900 crore of benami properties and assets in foreign shores worth Rs 1,600 crore were also seized. According to the Prime Minister, tax compliance has almost doubled due to demonetisation. “Nearly 338,000 shell companies have been identified and deregistered. Their directors have been disqualified”, the Prime Minister said.